Expedition Englund Marine Hoodies are slim fit, water resistant hooded pullovers made from 10oz Poly-Tech fabric. They feature an unlined hood, split stitch double needle dewing on all seams, flat hood drawstring and 1" x 1" ribbing on the cuffs and wristband. 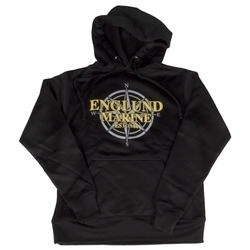 These hooded sweatshirts have the traditional Englund Marine compass rose and "Englund Marine Est 1944" on the front. Body LengthFrom Hips 25.5" 26.5" 27.5" 28.5" 29.5" 30.5" 31.5"
Chest Width1" Below Armhole 16" 20" 21" 22" 23" 24" 25"
Sleeve LengthShoulder to Hem 32.5" 33.5" 34.75" 36" 37.25" 38.5" 39.75"